I knew I was visiting the highest ground in England, but I certainly wasn't prepared for the climb to get there. We arrived in Buxton around ninety minutes before kick off, plenty of time for something to eat and drink ahead of kick off. From the hostelry to the ground was a walk of under ten minutes, but I soon realised just how this ground has reached such dizzy heights. The walk up a street made the likes of Rossendale Road and Brunshaw Road in Burnley look almost on the level. It was, without doubt the steepest road I've ever walked up, and as I struggled, along with other Burnley fans, it was quite embarrassing to see two locals, probably both in their 70s, walk it without any problems whatsoever. Once there it we were made very welcome as we finally took our place in the main stand ahead of kick off to watch some of Ash Hoskin's squad in action. The starting eleven was made up of eight young professionals, two apprentices in Ed Williams and goalkeeper Ben Woodhead, along with an unnamed trialist. Now a few years ago he might well have remained a mystery but internet access on mobile phones these days allows quick access to information and we soon learned it was Paris Cowan-Hall from Portsmouth. "Isn't he a Strictly Come Dancing judge?" I thought. In fact he's a young player who made his league debut last season whilst on loan at Grimsby. If he wanted to impress then he quickly did something about it. 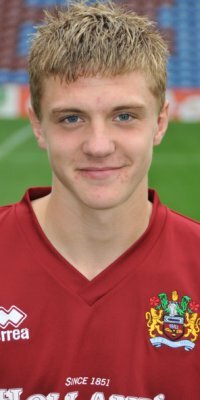 Right from the kick off we got forward down the left, and when Alex MacDonald crossed the ball the young P C-H was there to head home from close range with less than fifteen seconds gone. Not a bad start for him, for the team, or for new coach Hoskin. We had one or two scares in the first half but generally we were the better side and it was the same player who got the second and this was due to his quickness of thought and movement. He got on the end of a bad defensive mistake, was quick enough to get it round the goalkeeper and then slide it into the empty net. I thought we reserved some of our better football for the second half and it was a delight to see these young players passing the ball so well. We came close to a third when Alex MacDonald saw an effort come back off the bar. Whether it crossed the line or not I don't know but MacDonald himself looked adamant that it had. The third came from one of the best moves of the night which ended with a brilliant defence splitting pass from Chris Anderson that was met by Wes Fletcher. Wes did what he does best, as he went through and stroked the ball home past the advancing keeper. All in all this was hugely encouraging and very enjoyable stuff. The new coach must have been pleased whilst the watching Brian Laws, Russ Wilcox and Stuart Gray must have been enthused at some of the young talent coming through at Turf Moor. It's difficult to single any player out but I would make special mention of two. Firstly Michael King who I thought had an outstanding game playing out of position at left-back, and secondly Chris Lynch. This was Lynchy's first outing since he sustained a cruciate ligament injury last October whilst on loan at Chester City. He had a sound game but more importantly came through it, knee wise, with flying colours. Two of those who played last night will now be on the flight to Singapore tomorrow. Well done to Alex and Wes, and what an incentive for the rest of the team knowing that opportunities will come. The Burnley team was: Ben Woodhead, Ed Williams (Curtis Woods 71), Chris Lynch, Kevin Long, Michael King, Paris Cowan-Hall, Chris Anderson, Alex-Ray Harvey, Dominic Knowles, Wes Fletcher, Alex MacDonald. Subs not used: Dean Overson, Stephen Edwards, Dave Lynch, Joe McKee, Ross Wilson.